Come and listen to me discuss series 1 of the excellent In The Flesh (a beautiful, BAFTA award-winning zombie drama from the BBC) on The Skiffy and Fanty Show podcast. The episode is available from the their website by following the link above, or can be downloaded from The Skiffy and Fanty Show on iTunes as #26. In The Flesh (Season One) and is dated 20 September 2014. The recording was done back in August at LonCon3. I got to choose the subject and be on the show because I donated to a fundraiser and won in a draw. It was a lot of fun, especially because I got to meet four of the major talents behind the podcast in person, putting faces to voices. Plus I watch a lot of US TV (as readers of this blog have probably noticed), so it was kinda cool that I had an opportunity to get some Americans to watch such a fine and underrated example of British TV (seriously we need more stuff like this over here). Also I'm sure it makes for entertaining listening, especially if you like In The Flesh. If you're into geeky stuff you should totally listen to The Skiffy and Fanty Show, it was one of the first podcasts I started listening to over a year ago. They do a variety of stuff, including interviews, discussions and blog posts, all interesting and entertaining. In 2014 they've been looking at genre fiction from all over the world and had loads of international guests. They were also nominated for the Fancast Hugo this year. The episode I'm in is part of their Shoot the WISB series of subcasts, where they take a film -or in this case a short TV miniseries- and have a detailed conversation about it. These episodes are really interesting, but do get spoilery. There is an intro section, but it's usually best if you've seen the thing being discussed. They also do a regular feature called Torture Cinema, where they watch an awful film and get drunk while discussing it, those casts are hilarious. Note: at one point in the episode I said something bi-erasing without realising at the time. It's immediately covered in the conversation, but I should have known better. Apparently I have thoughts about Klingon culture and Worf's place in it. How did that happen? I'm a thoughtful person, and this show has sucked me in. Fear not, for I am aware that there plenty of ridiculous episodes (and films) in the future of this blog series. A Klingon First Officer wants to take part in the exchange programme from A Matter of Honour, which saw Riker briefly serve on a Klingon ship. The new First Officer, Kurn, is quickly unpopular. He’s learned Starfleet regulations, and is imposing them with a Klingon sense of discipline and hierarchy. The only person he’s not being tough on is Worf, who is offended that he seems to be getting special treatment. 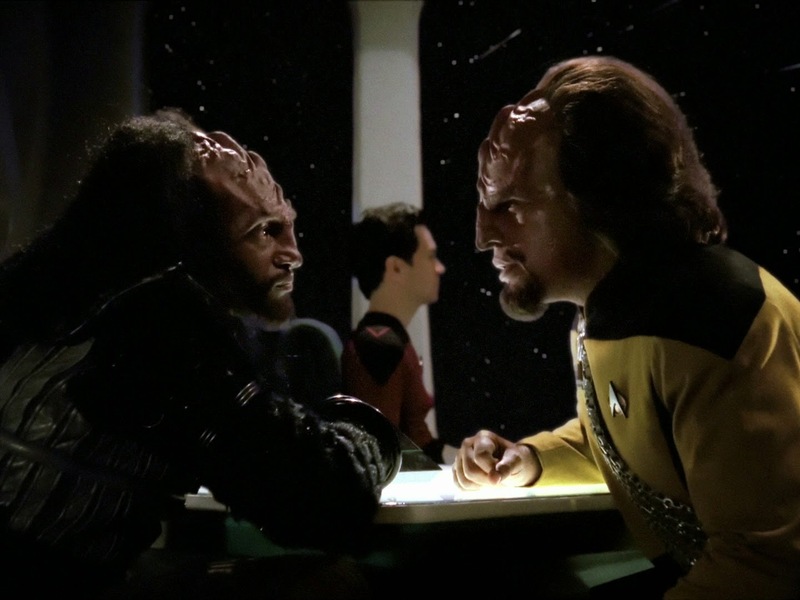 Worf confronts Kurn and it turns out that he is Worf’s long-lost brother. Their father is about to be denounced as a traitor because apparently he let in the Romulans who massacred and entire settlement (besides Worf). Kurn was only a baby at the time and was raised by family friends and not told his true parentage until he reached adulthood. As the eldest brother it is Worf’s place to challenge the verdict against their father and save the family honour. The Enterprise (having nothing better to do, it seems) brings the brothers to the Council. 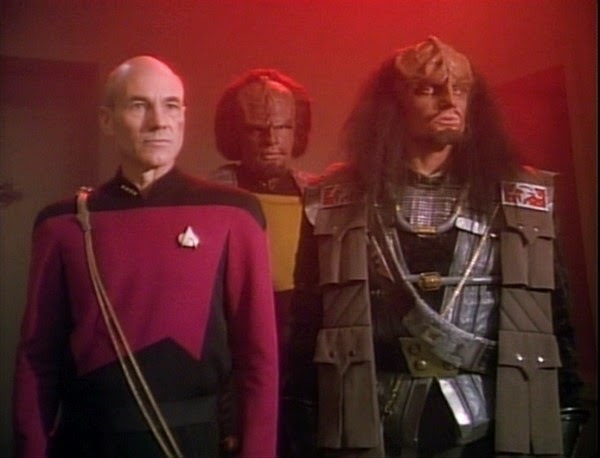 Kurn will be Worf’s second, but Worf forbids him from revealing they are related. The Klingon who brought the charges is particularly antagonistic towards Worf and the Council leader warns Worf to drop the challenge. Assassins are sent against Kurn, who is injured. Worf knows what’s happening is suspect and asks Picard to be his new second. The Enterprise crew investigate the claims against Worf’s father. They discover Worf’s old nurse also survived the massacre, and is conveniently living in the city. Picard visits to convince her to reveal the truth. She initially refused, but after he is attacked outside her home she agrees to come to the Council. Worf and Picard tell the Council they have evidence and a private meeting is called. The Council leader reveals that they know that the antagonistic guy’s father actually let the Romulans in. His family is very influential and the accusation could cause civil war. For the good of the Empire they chose Worf’s father as scapegoat because Worf’s in the Federation and they didn’t know about Kurn. Worf at first seems ready to offer his life, but Picard is unwilling. Then Worf says that if he publicly accepts the dishonour they will achieve what they want, on condition that Kurn is safe and his true lineage is kept secret. Picard tells a disbelieving Kurn that Worf wants him safe now so they can restore their father’s honour another day. 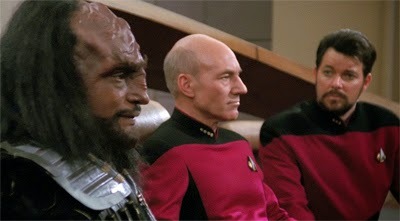 I suspect Picard is quietly amused by Kurn's command style and the crew's reaction to it. He says at a meal it's good to shake up the status quo sometimes. Of course it's easy to enjoy things being shook up if you aren't the one being shaken. Picard stands by Worf a lot here. 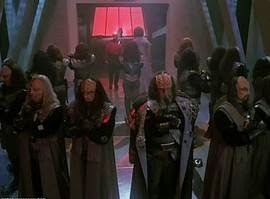 The Klingons are confused by his presence, though the Council leader respects Picard's defense of Worf's character, commendation from a senior officer is apparently a universally good thing. However there was a moment when it seemed as though the presence of a human could damage Worf's standing and I'm surprised that was not an issue, especially given Worf's background. I was also surprised when Worf asked Picard to be his second (Klingon word??). Admittedly he has no other Klingon allies, but I honestly thought he'd have chosen Riker. Worf and Riker seem to get on better, Worf wanted to go with Riker if he changed ship, and Riker is always portrayed as more physical than Picard. Then again Picard shows he can handle himself in a fight when he's jumped by 2 Klingons. I'm kinda surprised he did so well. Not a judgement of Picard so much as what I've been led to believe about human and Klingon strength differentials. Riker is very much in his middle-management role here (even though he's been temporarily relieved of duty). Geordi and Wesley complain to him about Kurn. Riker's job is to be the approachable face of the senior officers (and probably do some admin we never see). Picard kinda indicated this in the first episode, though he also suggested Riker should run interference when the Captain was faced with children. So Riker is the one who hears about Kurn's surprise inspections, altered the shifts in Engineering, and him being too hard on everyone but Worf. Riker is persuaded to have a word, and tries to draw comparison with his own time on a Klingon ship. Kurn doesn't take kindly to suggestions, but does refrain from killing him, as is the Starfleet way. Initially Worf is angry that the exchange-First Officer is apparently going easy on him and being strangely polite. It isn't the Klingon way and so Worf is insulted. 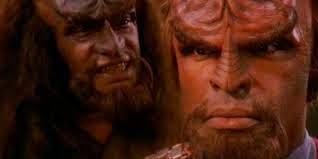 When Worf physically displays his anger Kurn believes he is truly a Klingon, there was doubt as he was raised by humans and is in Starfleet. Again we are reminded that Worf is restraining himself most of the time, and that he is very distanced from his own people. Then Worf is offended that his brother deceived everyone in order to inspect him before telling him the truth. This is an expected response, but Kurn explains that was because of the challenge, and presumably Kurn's secret parentage. Again we see the importance of honour and combat in Klingon society. 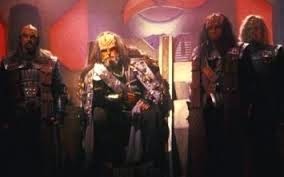 Even though Kurn is living as a member of a different house and Worf is essentially separated from Klingon society both want to ensure their father and family's honour is protected. Worf takes action even though it could mean his death, and nearly does. I was actually surprised that everything wasn't trial by combat. I guess I'd been swayed by the stereotypical view of Klingons we're normally presented with (you know, as people who will kill others for offering a suggestion). There was a fair bit of talking, investigation and negotiation (the kind of thing TNG normally does, in fact) and the fighting that took place was covert and so presumably with honour. Though it is acknowledged that the entire situation is very dishonourable. I suspect that Klingon society values the appearance of honour more than actual adherence to it, that's certainly what's going on here. Just as I'm sure a lot of what they say about killing people in social situations is big talk (even if they do have the ability to back it up). I've wondered before if Worf keeps his distance from his own people and culture because of uncertainty about how he will fit in. Now I think there may be an element of disillusionment, or fear of disillusionment, that drives him. He accepts the taint of a traitorous father in order to spare his brother's life. When the Council publicly turn their back on him it feels a little as though Worf is turning his back on them. He's spent his life being part of Klingon culture only on a personal level, admiring and upholding the ways of his people from afar, because he was usually the only Klingon around. On a personal level he knows that his honour is secure, and he's done the best thing for his family and for the Empire. Kurn refers to Wesley as Acting-Ensign, which is more correct than when anyone else calls him Ensign. Perhaps it shouldn't really matter, but every time Picard calls Wesley Ensign I just think how unfair it is on all the actual Ensigns. You know the ones who did the tests and went through the Academy. They can't help it if their parents aren't friends with the captain and their mothers aren't the ship's doctor. There's no indication of how often any of them get to fly the ship. You'd hope they get a chance on the other shift(s) that we don't see, but even then they don't get so much chance to work with the Captain. It just seems like if you're going to have a military style hierarchy you should stick to that. Then again I'm sure there are plenty of examples of nepotism in militaries throughout history. Wesley is unused to being commanded by someone who doesn't like him. 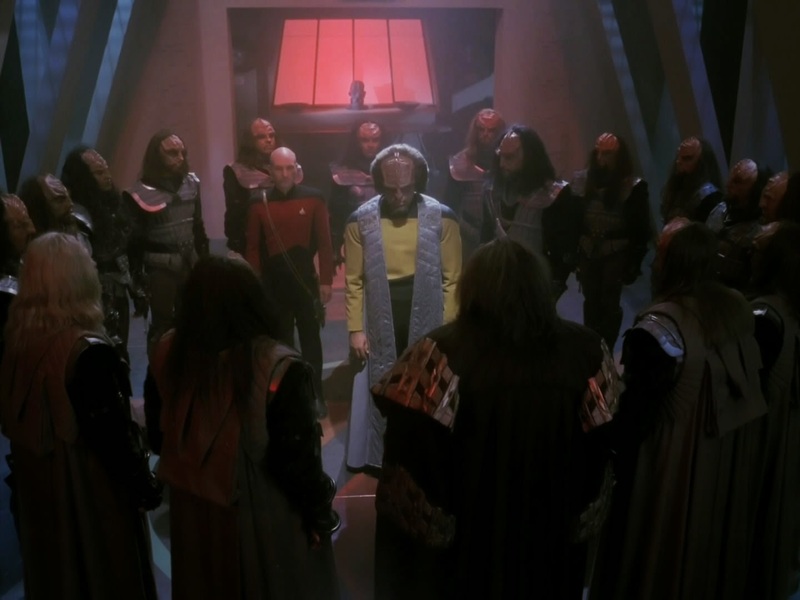 Worf accepts the dishonour of his father's fake-treachery in a ceremony in which the Council members cross their arms and turn their backs on him. Kurn is reluctant to do it, but Worf urges him to. Kurn turns his back. Worf and Picard resolutely walk out of the hall. FantasyCon 2014 happened in York on 5th - 7th September. This con report is a little delayed because I've only just gotten home from York. The convention coincided with my 5th wedding anniversary, so my husband and I decided to stay a while afterwards for a mini-holiday. It felt really nice to be back at FantasyCon, it was the first one since 2012. Every time I've been I've met people and had good conversations and come away feeling positive. This time there were so many people I knew, from cons and the internet. It was great to catch up with friends and meet new people. After the intensity of Loncon3 FantasyCon felt relaxed and friendly, as I'd expected. This year I was also on my very first panel. This was less relaxing, but still a very good experience. The other panelists were interesting people and we had a good discussion that was well-received, which is comforting when doing a panel about politics. I said some stuff I'd thought of in advance and some stuff in response to the discussion. I don't think I talked too much, but neither did I sit quietly. It's slightly hazy in my recollection, but I'm told I was amusing and you couldn't tell it was my first time. Even though I was nervy at first I relaxed into it. I'm really glad I did it and that my first panel was a positive experience. The convention had many interesting panels and events. There weren't things so many that you felt overwhelmed, but of course it's not a big con. The programme didn't just feature the normal basics but featured at a variety of subjects. This is likely to have been helped by the online survey the con had months ago asking for topic suggestions from attendees. It was nice to see them being proactive about involving attendees. FantasyCon is always good for books (2 years ago we broke a suitcase). There were many free books available at and after registration through the convention. There were various book launches and plenty to buy in the dealer's room. I also got some free review copies of various books (which will keep me occupied reading and writing for a while). The convention itself had a supportive environment and seemed to run very smoothly. This is largely down the the efforts of the con volunteers, called redcloaks. They gave up their time and worked hard to make it a success. The redcloaks were headed up by my friends Alasdair Stuart and Marguerite Kenner, who did an excellent job. They are an alarmingly organised couple with Marguerite clearly queen of her domain and Al being a friendly but determined blur for much of the time. I'm looking forward to returning to FantasyCon next year. I've put the titles of 25 songs by US band The Offspring into this post. Mostly because it amused me to do so. How many can you find? After going to a cybernetics conference Data creates another android called Lal, his child. Troi, Geordi and Wesley are the first to welcome this special delivery, they're shocked and amazed. Picard isn't happy when he's told. Data allows his child to choose its gender and appearance, and Lal chooses the form of a human female. Data adds the chosen features to his child, he's able to make her look more human than him. Days go by as Data teaches Lal, and updates her brain using his own, because he wants to get it right. She's got issues and asks philosophical questions about the meaning of life, which Data answers as best he can. Wesley suggests she come out and play with other children by going to school. An Admiral contacts Picard, alarmed by what Data has done, as though it's a conspiracy of one. He insists Lal be sent to Star Fleet research, without Data. Picard disagrees. In a parent teacher meeting Data is told that the kids aren't alright with having Lal in the class, she's so alone. Lal asks Data why the children were laughing at her (she assumed she'd mastered humour) and he has to explain that they were being unkind because they feared her and with kids it's cool to hate. Data goes to Dr Crusher for parenting advice, she suggests he share his experiences with Lal. Picard is woken by a message from the Admiral ordering the Enterprise be halted so he can come and inspect Lal. Data takes Lal to work in 10 Forward to observe and interact with her elders. 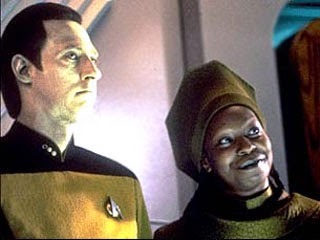 Guinan offers to teach her about listening. Lal can use contractions in her speech, showing that she's exceeding Data's programming. Picard breaks the news of the Admiral's visit to Data, who has been sending him progress reports. He assumes the Admiral is questioning his parenting skills, despite Picard's attempt to reassure him. While working in 10 Forward Lal learns about kissing and tries it out on a surprised Riker (who has been away all along). The Admiral arrives he'd made up his mind, he wants to keep 'em separated, if something happened to them both on the Enterprise it'd be genocide. Picard tries to talk him out of it, and won't order Data to give Lal up, even if it means his job. Admiral talks to Data about Lal and the ways she's exceeded his programming. Admiral interviews Lal, and she reacts badly to the idea that she could be taken many million miles away from her father. She goes to Troi and is overcome by feelings of fear. Meeting with Data the Admiral insists he tell Lal to go, Data refuses. Troi calls Data about Lal because stuff is messed up, she's returned to the lab, where she is programmed to go in case of danger. Lal's emotional awareness is apparently a malfunction. Data and the Admiral work on Lal to save her. The Admiral tells Geordi, Troi and Wesley that he and Data tried to save Lal, but it's hopeless. He's saddened by her loss and impressed with all Data did to save her. Lal says goodbye to her father and tells him that she loves him. 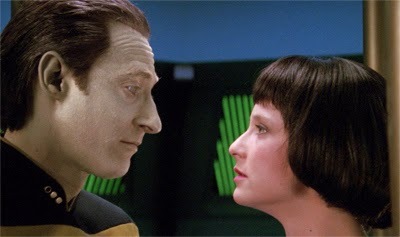 Data regrets that he cannot feel love for her and she says she loves him enough for both of them. Picard is initially shocked that Data was created Lal and wants to blackball the whole thing. 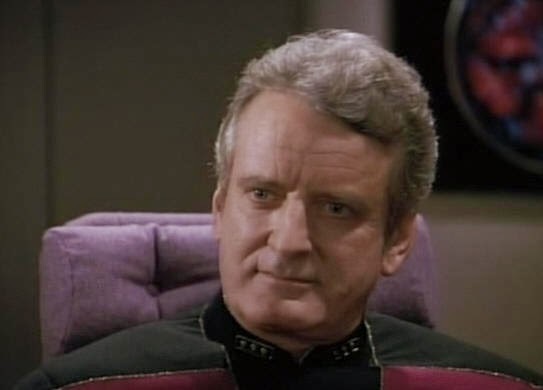 He tells Data that he should have been consulted before Lal was created, but Data points out that no one else has to consult with the Captain before procreating. Picard is weirded out by Data thinking of Lal as his child. 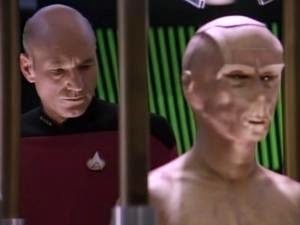 As Picard deals with the Admiral he initially wants to defend his officer, then he feels the need to fight for Data's rights as a parent and the androids' right to be a family. He brings up his action from The Measure of a Man where he successfully argued for android sentience. 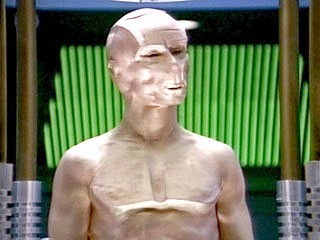 Data started creating Lal after a cybernetics convention, I'm guessing Data is a big hit at those things. In response to Picard's questioning Data explains that he's the only one of his kind and if anything happened he'd be completely destroyed. Odd to think about as in some respect Data is a total immortal. If he's successful with Lal his continuance is assured. He's apparently not counting his evil brother Lore. Data decides to allow his child to choose its own gender and appearance, which is nice. Though it's bad that Lal considers its gender-neutral state to be inadequate and Data insists it's essential to choose a gender, you'd hope that'd be less of an issue by then. Though Lal's initial form is creepy-looking, and random crewmembers in the corridors are surprisingly unfazed by Lal's presence. Data is able to give Lal more convincing skin and eye colour, I'm not sure why he hasn't upgraded his own appearance since he wants to become more human. I guess if Lal looks human people won't immediately realise she's an android as they always, always do with Data. Lal has a lot of questions about who and what she is, why she's different, why she should try to be the same. She develops emotions much quicker than Data, who continues to claim he doesn't have any, which I dispute. There's much fuss about Lal being able to use contractions because Data can't do it, so it means she's exceeded his programming. It seems weird to me that Data can understand numerous languages but can't use contractions, a simple linguistic function, even though he can identify and understand them. As that was a key difference between Data and Lore, there's no reason androids can't use them, it's probably that Data was purposefully created to be less human than his brother and this was one of the methods of achieving that. Data approaches Beverly for parenting advice when he realises Lal is lonely, he considers the doctor a successful parent. She says that Wesley used to have difficulty making friends (I'm not entirely surprised) and was able to help him with his self esteem by telling him about her own childhood when she wasn't very popular. Data realises that he can share his experience of difficulties assimilating. Beverly points out that he didn't have anyone to guide him, as Lal does. She also says that Data needs to give his daughter love and attention, but Data says he's incapable of providing love. Troi advises both Data and the Captain after Lal is activated. She makes a comment about Picard never being a parent, though Troi's parenting experience was not exactly normal and pretty short-lived. In fact Data's experience is better than Troi's in pretty much every way, starting with the fact that he actually chose to be a parent. Troi goes to the holodeck to advise on Lal's choice of gender and appearance. She's a bit alarmed to hear that they'll be looking at 1000s of options. She ends up going to sleep. If you've ever watched a friend build their avatar on a very customisable game then I'm sure you can sympathise. Data thinks that Lal can learn about socialising by being around the crew in a social setting. Guinan agrees and offers to teach Lal about listening, which is her speciality. She provides commentary while Lal watches a couple flirting and kissing, which Lal initially mistakes for biting. The admiral is alarmed that Lal is working in 10 Forward, but his concern seems to be about the waste of her processing power rather than the environment itself. Lal will continues to exist on in Data's head, but without a physical presence there seems to be little need for her to be mentioned. Data returns to the Bridge and Picard offers condolences. Data explains that he couldn't allow Lal to pass into oblivion, so he put her programming and memories into himself. It's like ET for androids, kinda. I guess the head is more important than the heart in beings of intelligence that don't have a circulatory system. Also if Data has all the knowledge and memories of Lal does that mean he'll be able to use contractions from now on?